The BBC host lamented the rising number of homeless people on the streets of Britain during the festive season, but forgot to explain why. Kevin Gulliver writes. You know things must be particularly bad when the BBC’s highest paying journalists start commenting on the nation’s social deprivation. “I’m not getting party political. But if we don’t notice the rough sleepers all around us at this time of year, as the sleet comes down and the Christmas lights go up, then there’s something deeply wrong with us”. I have similar feelings when I walk through central Birmingham. There are so many desperate individuals struggling to keep warm, find some food and shelter, and maintain some dignity in the face of having to beg or search bins. But Marr is deeply wrong. Annual rises in homelessness and rough sleeping have only become commonplace since 2010, and can be traced directly back to government housing and welfare policies. For the previous decade or so, homelessness and rough sleeping fell every year because the Labour government of that time was committed to eradicating these most visible signs of poverty and destitution. Since 2010, statutory homelessness – those applicants that local councils accept as homeless and in priority need – has risen by more than half and rough sleeping by 169%. Local council placement of homeless people in temporary accommodation – hostels and cheap bed and breakfast hotels – has expanded by two thirds. 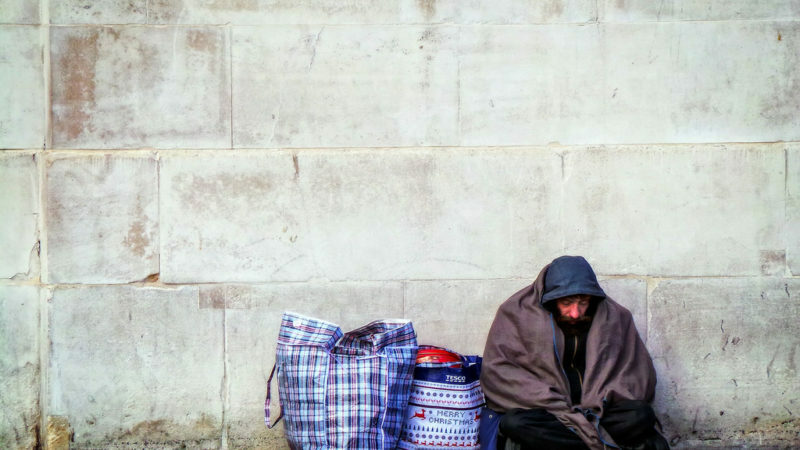 Despite the government’s promise to tackle the ‘burning injustice’ of homelessness, Shelter calculates that, all in all, 320,000 people are now homeless in Britain. That means that one in 200 people are homeless across the country. Shelter’s homelessness figures – including households accepted as homeless by local councils, rough sleepers and people living in temporary accommodation, such as hostels and cheap bed and breakfast hotels – may even underestimate the problem. The numbers of ‘hidden homeless’, such as sofa-surfers, those living in sheds or cars, or uncounted rough sleepers, are often more difficult to calculate. The Crisis homelessness monitor places the blame for the homelessness crisis straight on the doorsteps of Number 10 and 11 Downing Street during the Cameron-Osborne years. The first cause came from cutting social housing grants to housing associations – the largest single cut in the government’s austerity programme. Social house-building has now almost vanished. A second cause stems from the rising rate of evictions from private rented housing, linked to insecurity because of short tenancy lengths, and inadequate housing benefits to cover escalating private sector rents. The private rented sector now encompasses more than 20% of total homes – up from 15% just eight years ago – while social housing stagnates at 17%. This is the first time since the 1950s that private renting has outstripped the social sector. A third cause derives from stagnant wages and benefits for the majority of time since the international financial crisis hit while housing costs inexorably grew faster than inflation. Many low income households now find it very difficult to maintain a home. So Andrew Marr, political choices, made by the current government, have led to our current homelessness crisis. To be fair to Theresa May’s government, at least there are promises of more investment in social housing, alongside the recent creation of the Rough Sleeping and Homelessness Reduction Taskforce. Yet today’s homeless crisis forms a case study in how easily social problems can metastasize unless there is constant, and coordinated, public intervention. Kevin Gulliver is Director of Birmingham-based research charity the Human City Institute, is former Chair of the Centre for Community Research, and is part of the SHOUT save social housing campaign, but writes in a personal capacity.